Good news for Honor 9 Users, Latest Android 8.0 Oreo update for Honor 9 is now available for download. The Honor V9 Oreo Update is rolling out in China via OTA but if you are a European user then XDA Recognized Developer OldDroid also share a guide Update Honor 9 STF-L09 to Oreo. The update is based on the latest Emotion UI 8.0 and Featuring enhanced performance and security and EMUI 8.0 delivers a fresh experience that lets you get more out of your device. If you want to Install EMUI 8.0 on Honor 9 or want to Update Honor 9 to Android 8.0 Oreo Manually then you are in right place. Here we share a guide to Download and Install Android 8.0 Oreo On Honor 9. EMUI 8.0 brings all Android Oreo Features along with floating Navigation dock, home screen shortcuts, Faster AI-based optimizations deliver greater stability, fluidity, and speed, enhanced protection, and lots of new features and settings. Other than that Honor 9 EMUI 8.0 update comes with many new features and bug fixes. You can check the complete features and changelogs from below. 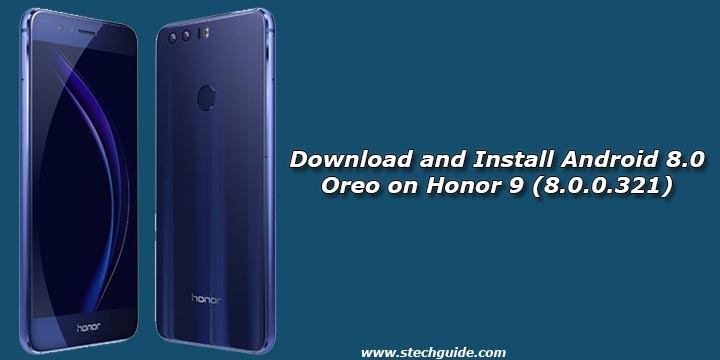 Follow below guide to Download and Install Android 8.0 Oreo On Honor 9 STF-L09. Honor 9 B321 Android 8.0 Oreo firmware update is available for Chinese STF-AL00 variants. The update is rolling out via OTA and available for Chinese users. EMUI 8.0 update for Honor 9 comes with a build number STF-AL00 8.0.0.321. But here we share a method to update both Chinese and European variants. Download Honor 9 Android 8.0 Oreo Firmware from below to update Honor 9 to Android Oreo manually. This Firmware file is only for Honor 9. Don’t try this on any other device. 1) First, you need to unlock the bootloader of Honor 9 and download and install a TWRP recovery. If you already had an unlocked bootloader and custom recovery installed on your device then skip this step. 2) Download Honor 9 B321 Oreo ROM from above and save it on your device. 6) Now flash the update_full_STF-AL00_all_cn.zip and update_data_full_public.zip files. 8) Done! This will Install Android 8.0 Oreo on Honor 9. 2) Now copy the L09-B321 firmware files to the root of your MicroSD card. 4) Now boot into recovery and connect the phone to your computer. 7) Done! The installation should start and your device will boot into oreo. Honor 9 Oreo bug fixes and Troubleshooting – After updating the device to Oreo you may have noticed few things like the honor bootanimation is missing, a problem in sounds (like ringtones, notifications, alarms), theme store not loading and problems with magazine lockscreen.If you are facing such issues the follow below process to fix them. 2) Now Boot into TWRP and flash the SuperSU zip file. 3) Now open Root file explorer (ES File explore or Root browser). If you are still facing the issues of any kind then it is recommended to factory reset and unroot your device. 3) Now boot into recovery and do a factory reset. 4) Reboot and setup your device and enjoy.